Recently we had an enquiry from a client of ours for slip resistant flooring (nothing unusual there!) but this time things were a little more complicated and technical… it had to be resistant to an array of chemical spillages. The contents of the IBCs are Glycerine, Propylene Glycol and a 7.2% Nicotine in Propylene Glycol. The flooring material has to be non porous, resistant to the aforementioned chemicals and ideally hard wearing as the chemicals are in IBCs so it will be subject to wear from manual pallet trucks etc. Chris, given potential for spillage of Glycerin which is viscous and slippery your options are: Polysafe Ultima or Apex. In knowing that we would have to plywood the sub-floor prior to installing vinyl (which would also cause its own problems… coming up later) we didn’t know if any of the contaminants already spilled onto the sub-floor would affect the newly fitted plywood – we told you this one wasn’t simple! 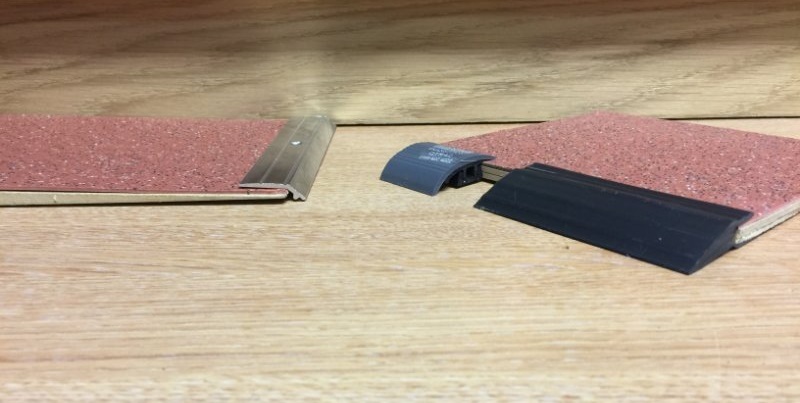 So our next call was to Graham Schoffield from F. Balls to find out which product would be best suited to containing the chemicals in the sub-floor and preventing them from contaminating the new plywood. After a detailed conversation we agreed the best way to stop the old sub-floor contaminating the plywood would be to paint on a damp proof membrane to the sub-floor first; basically sealing the spillages and isolating it. Now all we had to do was figure out how to finish off and to protect the edge of the flooring from the heavy pallet trucks; which are constantly driving heavy loads of chemicals over the floor/edges. Yet again this proved problematic as the plywood we would be fitting to the sub-floor would be 6mm thick, this would create a lip that has to be ‘ramped’ off safely for the pallet trucks and workers. I have mocked up a solution for you to have a look at for approval – as we discussed there are only so many ‘thresholds’ etc. The below pics show a 9mm Plywood (I only had this to hand in the shop) so I put it with a 9mm shim which ramps down to a slight lip. In our opinion, the only way of securing this down as permanently as we can guarantee is to mechanically fix and glue the aluminium profile (used in this example). So we would install a 6mm Plywood to the sub-floor as the shims (chamfered wood) only start from 6mm thick. I did a mock up below showing a 4mm plywood (2 pieces of hardboard glued together) and 2 alternative profiles – but having consulted the profile manufacturers, they think that with pump trucks constantly going over it the profiles will eventually break them!